1. You are more than welcome to visit us at our Diamond Bracelet Showroom. Monday to Friday 10am to 4pm. Saturday from 10am to 2pm. 2. Phone us anytime on 020 8446 8538 Monday to Friday between 9am and 6pm, and on Saturday from 10am to 2pm. 3. Send us a message anytime 24/7 on Live Chat, and we will reply very quickly. 4. Email us at info@diamond-bracelets.co.uk, anytime 24/7 and we will reply very quickly. The price of your Diamond Tennis Bracelets seems to be much cheaper than other High Street Jewellers. Can you explain this? 1. We are actual diamond jewellery manufacturers, so we do not deal with any middlemen. Everything is sourced directly. We cast, mount, set and polish every diamond bracelet from start to finish in our London workshops. 2. All our diamonds are supplied from our JV Partner factory in India, where every diamond is polished. The diamonds range in size from 0.01 Carat to 1.0 Carat in various diamond qualities, ranging from colours D-H. We double check each diamond on arrival for consistency of size, colour and purity. We can then put the diamonds into your Tennis Bracelet. 3 We do not have expensive West End, Hatton Garden or High Street premises. We are based in a beautiful showroom, in Finchley Central, North London. Reduced costs enable us to pass on the savings to our valued customers. 4. With global competition so fierce in this ever changing 21 st century, we always aim to work efficiently and keep costs to a minimum. Cheaper than the High Street Jeweller? The family of our MD, Jonathan Williams, has been in the UK jewellery industry for 65 years and Jonathan knows the industry very well. Until 2009, he was one of the biggest suppliers in the UK, selling to retailers and catalogue trade all over the country. If Jonathan supplied a diamond bracelet to a retailer for £1000, for example, that same bracelet would be in a jeweller’s window for anything up to £5000. Here at Diamond-bracelets.co.uk, we cut out the ‘middle man’. We are a manufacturer that sells directly to the public, with only an online presence and no high-street stores, so we know that our prices are impossible for any retail jeweller to achieve. Indeed, we are probably up to 75% cheaper than the average high-street jeweller. Read more about how we achieve our superb prices. 1. We are diamond jeweller manufacturers, so we do not deal with middle men. Our diamond are handpicked and polished for us in our Mumbai polishing factory, so each diamond matches the next for clarity, colour and width. 2. We don’t have costly High Street stores. We only have our London showroom, where you are more than welcome to make an appointment to visit us and view our bracelets in person. 3. We operate our business very efficiently, so our overheads are kept to minimum..
Can I place an order or buy on the day when I visit your showroom? We do have a large selection of Diamond Tennis Bracelets in stock. If there is one you like, you are more than welcome to pay and take it with you on the day. Alternatively, you can place an order and we will notify you when it is ready for collection or dispatch. Expected delivery time of your Diamond Tennis Bracelet...? We carry a very large stock of Diamond Tennis Bracelets, especially in 18 Carat White Gold and especially in G/H colour, SI purity. As this is our most popular item, there is a very good chance that if in stock, we will be able to dispatch your bracelet within a couple of working days. We do keep a stock of 18 Carat Yellow Gold, and 18 Carat Rose Gold Tennis Bracelets; depending upon availability this can be dispatched within 1-2 weeks. Everything else will be delivered within 3-4 weeks. We normally send the bracelet to the buyers address. 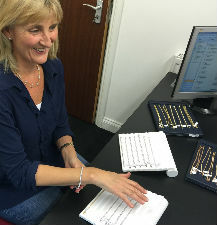 However, if the bracelet is a surprise gift inform us by email at info@diamond-bracelets.co.uk, by Live Chat, or simply give us a call on 020 8446 8358, and advise us of the delivery address. 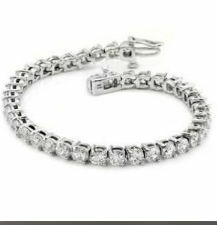 We will also be more than happy to oblige whenever possible, if you need the diamond bracelet quickly. Obviously if there is a change of plan or address to where you would like your bracelet sent, please email or phone and we will go through our security procedure to protect us both. We are open from 10am – 4pm Monday to Friday, and most Saturday’s by appointment from 10am to 2pm. You are more than welcome to come to our North London Showroom. 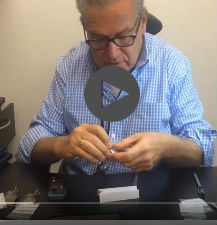 This would give you the opportunity to check that your bracelet is exactly what you had ordered, and that you are happy with the length. The standard length of our bracelets is 7.25 inches, but can be made shorter or longer as required. It is advisable to phone us in advance on 020 8446 853, so that we know that you are coming. We can then make sure that you bracelet is 100% ready with a full receipt, valuation and packaging. The diamonds used in our bracelets...? The diamond industry today is global, but all diamonds are rough in their original state. They have to be bought within the Kimberley Agreement. This guarantees that the diamonds that we use have been officially sourced and mined. The diamonds that we use in our bracelets mostly come from our JV Partner in Mumbai. We also purchase diamonds from brokers who come to us from all over the world primarily Antwerp, Mumbai and the USA. This enables us to offer diamonds at advantageous prices,which we are able to pass on to our customers. There are 4 ways in which you can order your bracelet. 1. Whilst here in our showroom, we can take a 30% deposit which secures your order, with the balance to be paid on collection. However, we may already have your item in stock. 2. We can take you order over the phone, with your payment details, and proceed to process your order. We will notify you when it is ready to be dispatched. 4. You can also pay with Pay 4 Later with 0% finance options available. How will I know when my bracelet is ready to be dispatched? We are more than happy to contact you the day your bracelet is ready to be dispatched. We will give you the Royal Mail Tracking Number and it will be sent fully insured and arrive the next day. If for any reason you are not happy with your diamond bracelet, providing it is returned in pristine condition and in its original packaging we are more than happy to change it for another bracelet. Alternatively we can offer you a full refund excluding the cost of postage. Fortunately, in 4 years of trading we have never had to give a refund!! 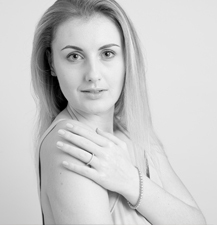 A diamond bracelet ordered in a shorter or longer length is classified as a bespoke bracelet. These are non-returnable, because as a bespoke item it would be very difficult to resell. 3. Send us a message on Live Chat. When the bracelet has been returned and we are satisfied that it is in pristine condition, we will immediately organise a refund. If I am from abroad, but am visiting you in the UK, will I be able to get a VAT Return Form? The answer is yes, when you come to collect your bracelet, providing you have your passport, proof of address, and are leaving the UK within 3 months. We will then be able to fill out a VAT Return Form which must be presented to the UK Customs when you leave the UK. We will give you a self-addressed envelope, invoice, and a letter with the form. When the form has been stamped by the Customs, and returned to us, we will refund to your account the VAT amount which is currently 20%. I live outside the EEC, am I exempt from paying VAT? The answer is yes!!! As you live outside the EEC, we do not charge you VAT, a saving of 20%. Do you belong to Trade Associations? We are full members of British Jewellers Association, which is the equivalent of the Bible in our industry. Our registration number is 50659. We are also members of The National Association of Jewellers and The British Allied Trades Federation. We are also a member of the GIA, which globally is the best certificate house for diamonds. Finally we are members of Rapnet, which means that we source our diamonds throughout the world at full trade prices. How do we get to your showroom in Finchley, North London to see the diamond bracelet collection? We are based at 48b, Hendon Lane, London N3 1TT. The nearest underground is Finchley Central on the Northern Line. There is free parking in Hendon Avenue; just 200 metres form us, though not between 2pm and 3pm, Monday – Friday. However, there is a ‘pay and display’ right outside our front door, which you can use at any time. We are open Monday – Friday from 10am to 4pm. You are welcome to pop in anytime, but it is advisable to contact us in advance, because it does get very busy in the showroom. On Saturday it is by appointment only between 10am -2pm.